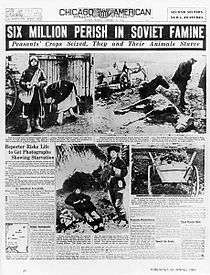 For the famine across the USSR, see Soviet famine of 1932–33. The Holodomor (Ukrainian: Голодомо́р, "Extermination by hunger" or "Hunger-extermination"; derived from морити голодом, "to kill by starvation"), also known as the Terror-Famine and Famine-Genocide in Ukraine, and—before the widespread use of the term "Holodomor," as well as currently still—referred to also as the Great Famine, and The Ukrainian Genocide of 1932–33 was a man-made famine in Ukraine in 1932 and 1933 that killed an estimated 2.5–7.5 million Ukrainians, with millions more counted in demographic estimates. It was part of the wider disaster, the Soviet famine of 1932–33, which affected the major grain-producing areas of the country. 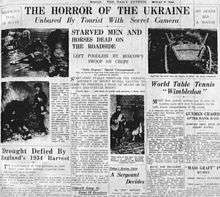 During the Holodomor millions of inhabitants of Ukraine, the majority of whom were ethnic Ukrainians, died of starvation in a peacetime catastrophe unprecedented in the history of Ukraine. Since 2006, the Holodomor has been recognized by the independent Ukraine and 24 other countries as a genocide of the Ukrainian people carried out by the Soviet Union. Early estimates of the death toll by scholars and government officials varied greatly; anywhere from 1.8 to 12 million ethnic Ukrainians were said to have perished as a result of the famine. Recent research has since narrowed the estimates to between 2.4 and 7.5 million. The exact number of deaths is hard to determine, due to a lack of records, but the number increases significantly when the deaths inside heavily Ukrainian-populated Kuban are included. Older estimates are still often cited in political commentary. According to the findings of the Court of Appeal of Kyiv in 2010, the demographic losses due to the famine amounted to 10 million, with 3.9 million direct famine deaths, and a further 6.1 million birth deficit. The word Holodomor literally translated from Ukrainian means "death by hunger", or "to kill by hunger, to starve to death". Sometimes the expression is translated into English as "murder by hunger or starvation". Holodomor is a compound of the Ukrainian words holod meaning "hunger" and mor meaning "plague". The expression moryty holodom means "to inflict death by hunger". The Ukrainian verb moryty (морити) means "to poison somebody, drive to exhaustion or to torment somebody". The perfective form of the verb moryty is zamoryty – "kill or drive to death by hunger, exhausting work". The word was used in print as early as 1978 by Ukrainian immigrant organisations in the United States and Canada. However, in the Soviet Union – of which Ukraine was a constituent republic – references to the famine were controlled, even after de-Stalinization in 1956. Historians could speak only of 'food difficulties', and the use of the very word golod/holod (hunger, famine) was forbidden. 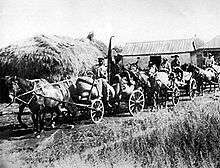 A "Red Train" of carts from the "Wave of Proletarian Revolution" collective farm in the village of Oleksiyivka, Kharkiv oblast in 1932. "Red Trains" took the first harvest of the season's crop to the government depots. During the "Holodomor", a man-made famine imposed by the Soviet Government, these brigades were part of the Government's policy of deliberately taking away the food of the peasants so as to facilitate their starvation. The famine had been predicted as far back as 1930 by academics and advisers to the Ukrainian Soviet Socialist Republic government, but little to no preventive action was taken. The famine affected the Ukrainian SSR as well as the Moldavian Autonomous Soviet Socialist Republic (a part of the Ukrainian SSR at the time) in the spring of 1932 and from February to July 1933, with the greatest number of victims recorded in the spring of 1933. Between 1926 and 1939, the Ukrainian population increased by 6.6%, whereas Russia and Belarus grew by 16.9% and 11.7%, respectively. The first reports of mass malnutrition and deaths from starvation emerged from two urban areas of the city of Uman, reported in January 1933 by Vinnytsia and Kiev oblasts. By mid-January 1933, there were reports about mass "difficulties" with food in urban areas, which had been undersupplied through the rationing system, and deaths from starvation among people who were withdrawn from the rationing supply. The withdrawal was to comply with the Central Committee of the Communist Party of Ukraine Decree of December 1932. 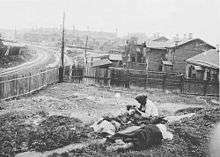 By the beginning of February 1933, according to reports from local authorities and Ukrainian GPU, the most affected area was Dnipropetrovsk Oblast, which also suffered from epidemics of typhus and malaria. 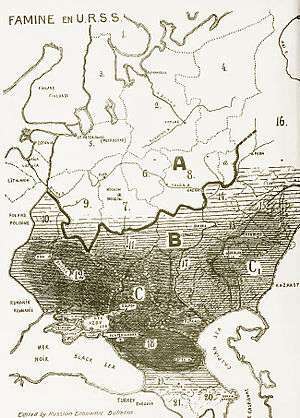 Odessa and Kiev oblasts were second and third, respectively. By mid-March, most of the reports of starvation originated from Kyiv Oblast. By mid-April 1933, Kharkiv Oblast reached the top of the most affected list, while Kiev, Dnipropetrovsk, Odessa, Vinnytsia, and Donetsk oblasts, and Moldavian SSR were next on the list. Reports about mass deaths from starvation, dated mid-May through the beginning of June 1933, originated from raions in Kyiv and Kharkiv oblasts. The "less affected" list noted Chernihiv Oblast and northern parts of Kyiv and Vinnytsia oblasts. The Central Committee of the CP(b) of Ukraine Decree of 8 February 1933 said no hunger cases should have remained untreated. Local authorities had to submit reports about the numbers suffering from hunger, the reasons for hunger, number of deaths from hunger, food aid provided from local sources, and centrally provided food aid required. The GPU managed parallel reporting and food assistance in the Ukrainian SSR. (Many regional reports and most of the central summary reports are available from present-day central and regional Ukrainian archives.) The Ukrainian Weekly, which was tracking the situation in 1933, reported the difficulties in communications and the appalling situation in Ukraine. The reasons for the famine are a subject of scholarly and political debate. Some scholars suggest that the man-made famine was a consequence of the economic problems associated with changes implemented during the period of Soviet industrialisation. Collectivisation also contributed to famine in 1932. Collectivization in the Soviet Union, including the Ukrainian SSR, was not popular among the peasantry; and forced collectivisation led to numerous peasant revolts. The first five-year plan changed the output expected from Ukrainian farms, from the familiar crop of grain to unfamiliar crops like sugar beets and cotton. In addition, the situation was exacerbated by poor administration of the plan and the lack of relevant general management. Significant amounts of grain remained unharvested, and – even when harvested – a significant percentage was lost during processing, transportation, or storage. However, it has also been proposed that the Soviet leadership used the man-made famine to attack Ukrainian nationalism, and thus the man-made famine may fall under the legal definition of genocide. For example, special and particularly lethal policies were adopted in and largely limited to Soviet Ukraine at the end of 1932 and 1933. According to Snyder: "[E]ach of them may seem like an anodyne administrative measure, and each of them was certainly presented as such at the time, and yet each had to kill." By the end of 1933, millions of people had starved to death or had otherwise died unnaturally in Ukraine and the other Soviet republics. The total number of population losses (famine death and birth deficit) across the entire Soviet Union is estimated as 6–7 million. The Soviet Union long denied that the famine had taken place. The NKVD (and later KGB) archives on the Holodomor period made records available very slowly. The exact number of the victims remains unknown and is probably impossible to estimate, even within a margin of error of a hundred thousand. The media have reported estimates by historians of fatalities as high as seven to ten million. Former Ukrainian president Yushchenko stated in a speech to the United States Congress that the Holodomor "took away 20 million lives of Ukrainians", while former Canadian Prime Minister Stephen Harper issued a public statement giving the death toll at about 10 million. The use of this figure has been criticised by historians Timothy D. Snyder and Stephen G. Wheatcroft. Snyder wrote: "President Viktor Yushchenko does his country a grave disservice by claiming ten million deaths, thus exaggerating the number of Ukrainians killed by a factor of three; but it is true that the famine in Ukraine of 1932–1933 was a result of purposeful political decisions, and killed about three million people." In an email to Postmedia News, Wheatcroft wrote: "I find it regrettable that Stephen Harper and other leading Western politicians are continuing to use such exaggerated figures for Ukrainian famine mortality" and "There is absolutely no basis for accepting a figure of 10 million Ukrainians dying as a result of the famine of 1932–33." Estimates vary in their coverage, with some using the 1933 Ukraine borders, some the current borders, and some counting ethnic Ukrainians. Some extrapolate on the basis of deaths in a given area, while others use archival data. 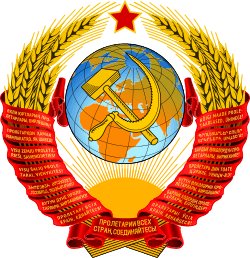 Some historians question the accuracy of Soviet censuses, as they may reflect Soviet propaganda. Other estimates come from recorded discussions between world leaders like Churchill and Stalin. In an August 1942 conversation, Stalin gave Churchill his estimates of the number of "kulaks" who were repressed for resisting collectivisation as 10 million, in all of the Soviet Union, rather than only in Ukraine. When using this number, Stalin implied that it included not only those who lost their lives, but also those who were forcibly deported. Additionally there are variations in opinion as to whether deaths in Gulag labour camps should be counted, or only those who starved to death at home. The estimate prior to the opening of the former Soviet archives varied widely but the range was narrower: for example, 2.5 million (Volodymyr Kubiyovych), 4.8 million (Vasyl Hryshko) and 5 million (Robert Conquest). One modern calculation that uses demographic data, including those recently available from Soviet archives, narrows the losses to about 3.2 million or, allowing for the lack of precise data, 3 million to 3.5 million. Soviet archives show that excess deaths in Ukraine in 1932–1933 numbered a minimum of 1.8 million (2.7 including birth losses). This source further states "Depending upon the estimations made concerning unregistered mortality and natality, these figures could be increased to a level of 2.8 million to a maximum of 4.8 million excess deaths and to 3.7 million to a maximum of 6.7 million population losses (including birth losses)". In 1932–1933, there were 1.2 million cases of typhus and 500,000 cases of typhoid fever. Malnourishment increases fatality rates from many diseases, and are not counted by some historians. From 1932 to 1934, the largest rate of increase was recorded for typhus, commonly spread by lice. In conditions of harvest failure and increased poverty, lice are likely to increase. Gathering numerous refugees at railway stations, on trains and elsewhere facilitates the spread. In 1933, the number of recorded cases was 20 times the 1929 level. The number of cases per head of population recorded in Ukraine in 1933 was already considerably higher than in the USSR as a whole. By June 1933, incidence in Ukraine had increased to nearly 10 times the January level, and it was much higher than in the rest of the USSR. The number of recorded excess deaths extracted from the birth/death statistics from Soviet archives is contradictory. The data fail to add up to the differences between the results of the 1926 Census and the 1937 Census. Kulchytsky summarised the natural population change. The declassified Soviet statistics show a decrease of 538,000 people in the population of Soviet Ukraine between 1926 census (28,925,976) and 1937 census (28,388,000). The number of births and deaths (in thousands) according to the declassified records are given in the table (right). A 2002 study by Vallin et al. utilising some similar primary sources to Kulchytsky, and performing an analysis with more sophisticated demographic tools with forward projection of expected growth from the 1926 census and backward projection from the 1939 census estimates the amount of direct deaths for 1933 as 2.582 million. This number of deaths does not reflect the total demographic loss for Ukraine from these events as the fall of the birth rate during crisis and the out-migration contribute to the latter as well. The total population shortfall from the expected value between 1926 and 1939 estimated by Vallin amounted to 4.566 million. Of this number, 1.057 million is attributed to birth deficit, 930,000 to forced out-migration, and 2.582 million to the combination of excess mortality and voluntary out-migration. With the latter assumed to be negligible this estimate gives the number of deaths as the result of the 1933 famine about 2.2 million. According to this study the life expectancy for those born in 1933 sharply fell to 10.8 years for females and to 7.3 years for males and remained abnormally low for 1934 but, as commonly expected for the post-crisis peaked in 1935–36. According to one estimate about 81.3% of the famine victims in the Ukrainian SSR were ethnic Ukrainians, 4.5% Russians, 1.4% Jews and 1.1% were Poles. Many Belarusians, Hungarians, Volga Germans and other nationalities became victims as well. The Ukrainian rural population was the hardest hit by the Holodomor. Since the peasantry constituted a demographic backbone of the Ukrainian nation, the tragedy deeply affected the Ukrainians for many years. In an October 2013 opinion poll (in Ukraine) 38.7% of those polled stated "my families had people affected by the famine", 39.2% stated they did not have such relatives, and 22.1% did not know. In response to the demographic collapse, the Soviet authorities ordered large-scale resettlements, with over 117,000 of peasants from remote regions of Soviet Union taking over the deserted farms. According to them, only taking an action whose sole objective is to cause deaths among the peasantry counts as intent. Taking an action with some other goal (e.g. exporting grain to import machinery) but which the actor certainly knows will also cause peasants to starve does not count as intentionally starving the peasants. However, this is an interpretation of 'intent' which flies in the face of the general legal interpretation. Genocide scholar Adam Jones stresses that many of the actions of the Soviet leadership during 1931–32 should be considered genocidal. Not only did the famine kill millions, it took place against "a backdrop of persecution, mass execution, and incarceration clearly aimed at undermining Ukrainians as a national group". Norman Naimark, a historian at Stanford University who specialises in many fields of modern European history, genocide and ethnic cleansing, argues that some of the actions of Stalin's regime, not only those during the Holodomor but also Dekulakization and targeted campaigns (with over 110,000 shot) against particular ethnic groups, can be looked at as genocidal. In 2006, the Security Service of Ukraine declassified more than 5,000 pages of Holodomor archives. These documents suggest that the Soviet regime singled out Ukraine by not giving it the same humanitarian aid given to regions outside it. The statistical distribution of famine's victims among the ethnicities closely reflects the ethnic distribution of the rural population of Ukraine Moldavian, Polish, German and Bulgarian population that mostly resided in the rural communities of Ukraine suffered in the same proportion as the rural Ukrainian population. [T]he evidence of a large-scale famine was so overwhelming, was so unanimously confirmed by the peasants that the most "hard-boiled" local officials could say nothing in denial. Chamberlin was a Moscow correspondent of the Christian Science Monitor for 10 years. 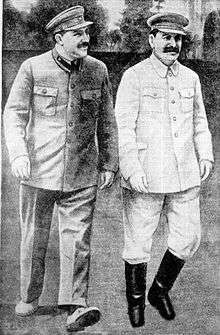 In 1934, he was reassigned to the Far East. After he left the Soviet Union he wrote his account of the situation in Ukraine and North Caucasus (Poltava, Bila Tserkva, and Kropotkin). Chamberlin later published a couple of books: Russia's Iron Age and The Ukraine: A Submerged Nation. Holodomor denial is the assertions that the 1932–1933 genocide in Soviet Ukraine either did not occur or did occur but was not a premeditated act. Denying the existence of the famine was the Soviet state's position and reflected in both Soviet propaganda and the work of some Western journalists and intellectuals including George Bernard Shaw, Walter Duranty and Louis Fischer. In the Soviet Union, authorities all but banned discussion of the famine, and Ukrainian historian Stanislav Kulchytsky stated the Soviet government ordered him to falsify his findings and depict the famine as an unavoidable natural disaster, to absolve the Communist Party and uphold the legacy of Stalin. The famine is officially considered by the modern Ukrainian government to be an act of genocide. United States and Europe do not recognize it as such, but consider that the Holodomor was an attack on the Ukrainian people. In 2007, President Viktor Yushchenko declared he wants "a new law criminalising Holodomor denial", while Communist Party head Petro Symonenko said he "does not believe there was any deliberate starvation at all", and accused Yushchenko of "using the famine to stir up hatred". Few in Ukraine share Symonenko's interpretation of history and the number of Ukrainians who deny the famine or view it as caused by natural reasons is steadily falling. In the former Soviet Union millions of men, women and children fell victims to the cruel actions and policies of the totalitarian regime. The Great Famine of 1932–1933 in Ukraine (Holodomor), took from 7 million to 10 million innocent lives and became a national tragedy for the Ukrainian people. In this regard we note activities in observance of the seventieth anniversary of this Famine, in particular organized by the Government of Ukraine. 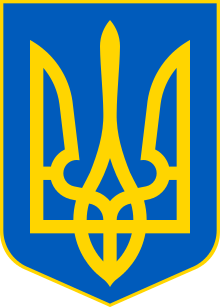 Nationwide, the political repression of 1937 (The Great Purge), under the guidance of Nikolai Yezhov, was known for its ferocity and ruthlessness, but Lev Kopelev wrote, "In Ukraine 1937 began in 1933", referring to the comparatively early beginning of the Soviet crackdown in Ukraine. On 26 April 2010, newly elected Ukrainian President Viktor Yanukovych told Parliamentary Assembly of the Council of Europe members that Holodomor was a common tragedy that struck Ukrainians and other Soviet peoples, and that it would be wrong to recognise the Holodomor as an act of genocide against one nation. He stated that "The Holodomor was in Ukraine, Russia, Belarus and Kazakhstan. It was the result of Stalin's totalitarian regime. But it would be wrong and unfair to recognize the Holodomor as an act of genocide against one nation." He has, however, referred to it as a crime, a tragedy, and an Armageddon, while maintaining use of the word "Holodomor" to describe the event. In response to Yanukovych's statements, the Our Ukraine Party alleged that Yanukovych directly violated Ukrainian law which defines the Holodomor as genocide against the Ukrainian people and makes public denial of the Holodomor unlawful. Our Ukraine Party also asserted that Yanukovych "ignored a ruling of 13 January 2010 by Kiev's Court of Appeal, which recognized the leaders of the totalitarian Bolshevik regime as those guilty of 'genocide against the Ukrainian national group in 1932–33 through the artificial creation of living conditions intended for its partial physical destruction.'" In 2012, Yanukovych referred to the Holodomor as a crime which caused fear and obedience. On 23 October 2008, the European Parliament adopted a resolution that recognised the Holodomor as a crime against humanity. 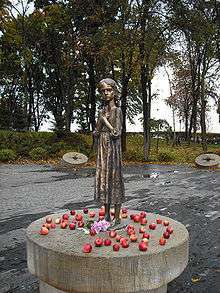 On 27 April 2010, a draft Parliamentary Assembly of the Council of Europe resolution declared the famine was caused by the "cruel and deliberate actions and policies of the Soviet regime" and was responsible for the deaths of "millions of innocent people" in Ukraine, Belarus, Kazakhstan, Moldova and Russia. Even though PACE found Stalin guilty of causing the famine, it rejected several amendments to the resolution, which proposed the Holodomor be recognized as an act of genocide against the Ukrainian people. Since 2006, Ukraine officially marks a Holodomor memorial day on the fourth Saturday of November. In 2007, the 74th anniversary of the Holodomor was commemorated in Kyiv for three days on the Maidan Nezalezhnosti. As part of the three-day event, from 23 to 25 November, video testimonies of the communist regime's crimes in Ukraine, and documentaries by famous domestic and foreign film directors were shown. In addition, experts and scholars gave lectures on the topic. As well, on 23 November 2007, the National Bank of Ukraine issued a set of two commemorative coins remembering the Holodomor. As of 2009, Ukrainian schoolchildren take a more extensive course of the history of the Holodomor, plus fighters in the Organization of Ukrainian Nationalists and Ukrainian Insurgent Army. On 22 November 2008, Ukrainian Canadians marked the beginning of National Holodomor Awareness Week. Citizenship, Immigration and Multiculturalism Minister Jason Kenney attended a vigil in Kyiv. In November 2010, Prime Minister Stephen Harper visited the Holodomor memorial in Kyiv, although Ukrainian President Viktor Yanukovych did not join him. Saskatchewan became the first jurisdiction in North America and the first province in Canada to recognize the Holodomor as a genocide. 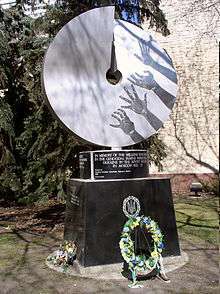 The Ukrainian Famine and Genocide (Holodomor) Memorial Day Act was introduced in the Saskatchewan Legislature on May 6, 2008 and received royal assent on May 14, 2008. On September 21 2014, a statue entitled "Bitter Memories of Childhood" was unveiled outside the Manitoba Legislature Building in Winnipeg. On 29 May 2008, the city of Baltimore held a candlelight commemoration for the Holodomor at the War Memorial Plaza in front of City Hall. This ceremony was part of the larger international journey of the "International Holodomor Remembrance Torch", which began in Kiev and made its way though thirty-three countries. Twenty-two other US cities were also visited during the tour. Then-Mayor Sheila Dixon presided over the ceremony and declared 29 May to be "Ukrainian Genocide Remembrance Day in Baltimore". She referred to the Holodomor "among the worst cases of man's inhumanity towards man". On 2 December 2008, a ceremony was held in Washington, D.C., for the Holodomor Memorial. On 13 November 2009, U.S. President Barack Obama released a statement on Ukrainian Holodomor Remembrance Day. In this he said that "remembering the victims of the man-made catastrophe of Holodomor provides us an opportunity to reflect upon the plight of all those who have suffered the consequences of extremism and tyranny around the world". NSC Spokesman Mike Hammer released a similar statement on 20 November 2010. In 2011, the U.S. day of remembrance of Holodomor was held on 19 November. The statement released by the White House Press Secretary reflects on the significance of this date, stating: "...in the wake of this brutal and deliberate attempt to break the will of the people of Ukraine, Ukrainians showed great courage and resilience. The establishment of a proud and independent Ukraine twenty years ago shows the remarkable depth of the Ukrainian people's love of freedom and independence." ↑ Davies & Wheatcroft 2010, pp. 479–484. ↑ Graziosi, Andrea (2005). LES FAMINES SOVIÉTIQUES DE 1931–1933 ET LE HOLODOMOR UKRAINIEN. Cahier du Monde Russe. p. 464. ↑ Davies 2006, p. 145. ↑ Baumeister 1999, p. 179. ↑ Sternberg & Sternberg 2008, p. 67. ↑ "Ukrainian Genocide of 1932–1933". Ukrainian Genocide Famine Foundation – USA, Inc. Retrieved 22 November 2016. 1 2 "The famine of 1932–33". Encyclopædia Britannica online. Retrieved 2 November 2015. The Great Famine (Holodomor) of 1932–33 – a man-made demographic catastrophe unprecedented in peacetime. Of the estimated six to eight million people who died in the Soviet Union, about four to five million were Ukrainians... Its deliberate nature is underscored by the fact that no physical basis for famine existed in Ukraine... Soviet authorities set requisition quotas for Ukraine at an impossibly high level. Brigades of special agents were dispatched to Ukraine to assist in procurement, and homes were routinely searched and foodstuffs confiscated... The rural population was left with insufficient food to feed itself. ↑ ЗАКОН УКРАЇНИ: Про Голодомор 1932–1933 років в Україні [LAW OF UKRAINE: About the Holodomor of 1932–1933 in Ukraine]. rada.gov.ua (in Ukrainian). 28 November 2006. Retrieved 6 May 2015. ↑ "International Recognition of the Holodomor". Holodomor Education. Retrieved 26 December 2015. ↑ Snyder 2010, p. 53. "One demographic retrojection suggests a figure of 2.5 million famine deaths for Soviet Ukraine. This is too close to the recorded figure of excess deaths, which is about 2.4 million. The latter figure must be substantially low, since many deaths were not recorded. Another demographic calculation, carried out on behalf of the authorities of independent Ukraine, provides the figure of 3.9 million dead. The truth is probably in between these numbers, where most of the estimates of respectable scholars can be found. It seems reasonable to propose a figure of approximately 3.3 million deaths by starvation and hunger-related disease in Soviet Ukraine in 1932–1933". 1 2 Наливайченко назвал количество жертв голодомора в Украине [Nalyvaichenko called the number of victims of Holodomor in Ukraine] (in Russian). LB.ua. 14 January 2010. Retrieved 21 July 2012. ↑ "Yulia Tymoshenko: our duty is to protect the memory of the Holodomor victims". Tymoshenko's official website. 27 November 2010. Archived from the original on 2010-11-29. Retrieved 21 July 2012. ↑ Naimark 2010, p. 70. 1 2 3 "Harper accused of exaggerating Ukrainian genocide death toll". MontrealGazette.com. 30 October 2010. Retrieved 21 July 2012. ↑ Davies & Wheatcroft 2002, p. 77. "[T]he drought of 1931 was particularly severe, and drought conditions continued in 1932. This certainly helped to worsen the conditions for obtaining the harvest in 1932". ↑ Engerman 2003, p. 194. ↑ Josef Zisels; Halyna Kharaz (11 November 2007). "Will Holodomor receive the same status as the Holocaust?". world.maidan.org.ua. Archived from the original on 28 June 2007. Retrieved 21 July 2012. ↑ Y. A. Mytsyk (2003). Трагедія Голодомору у спогадах очевидців [The tragedy of the Holodomor in the memories of eyewitnesses]. archives.gov.ua. Retrieved 9 December 2015. ↑ Stanislav Kulchytsky (2 September 2008). "The Holodomor of 1932–1933: the scholarly verdict". day.kiev.ua. Retrieved 9 December 2015. 1 2 3 4 "Seven million died in the 'forgotten' holocaust – Eric Margolis". www.ukemonde.com. Retrieved 2016-01-05. 1 2 Peter Finn (27 April 2008). "Aftermath of a Soviet Famine". WashingtonPost.com. Retrieved 21 July 2012. There are no exact figures on how many died. Modern historians place the number between 2.5 million and 3.5 million. Yushchenko and others have said at least 10 million were killed. 1 2 David Marples (30 November 2005). "The Great Famine Debate Goes On...". Edmonton Journal. Archived from the original on 15 April 2009. Retrieved 21 July 2012. 1 2 Kulchytsky, Stanislav. "Holodomor-33: Why and how?". Zerkalo Nedeli (25 November – 1 December 2006). |access-date= requires |url= (help) Russian version. ↑ Werth 2010, p. 396. 1 2 Fawkes, Helen (24 November 2006). "Legacy of famine divides Ukraine". BBC News. Retrieved 21 July 2012. ↑ Hadzewycz, Zarycky & Kolomayets 1983. ↑ Bilinsky, Yaroslav (July 1983). "Shcherbytskyi, Ukraine, and Kremlin Politics". Problems of Communism. ↑ Graziosi, Andrea (2004–2005). "The Soviet 1931–1933 Famines and the Ukrainian Holodomor: Is a New Interpretation Possible, and What Would Its Consequences Be?". Harvard Ukrainian Studies. 27 (1–4): 97–115. JSTOR 41036863. ↑ U.S. Commission on the Ukraine Famine (1988). Investigation of the Ukrainian Famine 1932–1933. Washington, DC: United States Government Printing Office. p. 67. Archived from the original on 2007-01-07. Retrieved 27 July 2012. ↑ Mace 2008, p. 132. ↑ Vyacheslav T. Busel, ed. (2001). Великий тлумачний словник сучасної української мови:- Голодомор [Great Explanatory Dictionary of Modern Ukrainian:- Holodomor] (in Ukrainian). Irpin, Perun (2004). ISBN 966-569-013-2. Retrieved 29 February 2016. Artificial famine organised on a vast scale by criminal authorities against the population of their own country. ↑ Dawood, M; Mitra A (December 2012). "Hidden agendas and hidden illness". Diversity and Equality in Health and Care. 9 (4): 297–8. ↑ ""Голодомор 1932–33 років в Україні: документи і матеріали"/ Упорядник Руслан Пиріг; НАН України.Ін-т історії України.-К. :Вид.дім "Києво-Могилянська академія", "Famine in Ukraine 1932–33: documents and materials / compiled by Ruslan Pyrig National Academy of Sciences of Ukraine. Institute of History of Ukraine. -K.:section Kiev-Mohyla Academy 2007". Archives.gov.ua. Retrieved 2012-09-07. ↑ Davies & Wheatcroft 2010, p. 204. ↑ "University of Toronto Data Library Service". Archived from the original on 2011-07-06. ↑ Davies & Wheatcroft 2010, p. 470, 476. ↑ Davies & Wheatcroft 2010, p. xviii. ↑ Холодомор – 2009. Retrieved 6 November 2010. ↑ "Голод 1932–1933 років на Україні: очима істориків, мовою документів". Archives.gov.ua. Retrieved 2012-09-07. ↑ Сокур, Василий [Sokur, Vasily] (21 November 2008). Выявленным во время голодомора людоедам ходившие по селам медицинские работники давали отравленные "приманки" – кусок мяса или хлеба. Facts and Commentaries (in Russian). Retrieved 27 July 2012. The author suggests that never in the history of mankind was cannibalism so widespread as during the Holodomor. ↑ Várdy & Várdy 2007. ↑ Boriak, Hennadii (November 2008). "Holodomor Archives and Sources: The State of the Art" (PDF). The Harriman Review. 16 (2): 30. Archived from the original (PDF) on 12 December 2011. ↑ David Marples (30 November 2005). "The great famine debate goes on...". Edmonton Journal. ExpressNews, University of Alberta. Archived from the original on 15 June 2008. 1 2 Snyder 2010, pp. 42–46. ↑ The term anodyne administrative measure in the quote means a measure that was not meant to solve the problem but to calm the hungry crowds, or a measure which, in of itself, would not create opposition (See wiktionary:Anodyne). The term 'Anodyne' refers to pain relieving methods, drugs or remedies, used prior to the 20th century. ↑ Valeriy Soldatenko (2003). Голодный тридцать третий субъективные мысли об объективных процессах [The starvation of '33: subjective thoughts about objective processes]. Zerkalo Nedeli (in Russian) (24, 28 June-4 July). Archived from the original on 11 November 2004. Valeriy Soldatenko (2003). Голодний тридцять третій суб'єктивні думки про об'єктивні процеси [The starvation of '33: subjective thoughts about objective processes]. Zerkalo Nedeli (in Ukrainian) (24, 28 June–4 July). Archived from the original on 13 March 2007. ↑ Fawkes, Helen (24 November 2006). "Legacy of famine divides Ukraine". BBC News. Retrieved 22 July 2012. 1 2 Sheeter, Laura (24 November 2007). "Ukraine remembers famine horror". BBC News. Retrieved 21 July 2012. ↑ Kulchytsky, Stanislav (22 August 2003). Причины голода 1933 года в Украине по страницам одной подзабытой книги [Reasons for the 1933 famine in Ukraine according to the pages of one all but forgotten book]. Zerkalo Nedeli (in Russian) (16). Archived from the original on 14 January 2006. Retrieved 25 July 2012. During the hearings, the Ukrainian politician Stefan Khmara said, 'I would like to address the scientists, particularly, Stanislav Kulchytsky, who attempts to mark down the number of victims and counts them as 3–3.5 million. I studied these questions analysing the demographic statistics as early as in 1970s and concluded that the number of victims was no less than 7 million'. ↑ Yushchenko, Viktor (27 November 2007). "Holodomor". The Wall Street Journal. Archived from the original on 2008-09-08. Retrieved 21 July 2012. ↑ "Ukrainian President Yushchenko: Yushchenko's Address before Joint Session of U.S. Congress". Official Website of President of Ukraine. 6 April 2005. Archived from the original on 6 October 2006. Retrieved 7 September 2012. 1 2 "Holocaust: The ignored reality". Eurozine. 25 June 2009. Retrieved 22 November 2010. ↑ Kulchytsky & Yefimenko 2003, pp. 42–63. ↑ Davies & Wheatcroft 2010, p. 429. ↑ Davies & Wheatcroft 2010, p. 512. 1 2 Vallin et al. 2002. ↑ Meslé, Pison & Vallin 2005, "What is striking in the long-term picture of Ukrainian life expectancy is the devastating impact of the calamities of the 1930s and 1940s. In 1933, the famine which had occasioned unparalleled excess mortality of 2.2 million, cut the period life expectancy to a low of under 10 years". 1 2 3 4 5 "Poll: Almost two-thirds of Ukrainians believe famine of 1932–1933 was organized by Stalinist regime". Interfax-Ukraine. 20 November 2013. Retrieved 28 February 2016. ↑ "Post-holodomor Population Resettlements to Ukraine (1933–1934)". citation.allacademic.com. Retrieved 2015-06-15. ↑ Davies & Wheatcroft 2006. 1 2 3 4 Ellman 2007. ↑ Jones 2010, pp. 136–7. ↑ "FSI/CISAC – Norman M. Naimark, MS, PhD". Cisac.fsi.stanford.edu. Retrieved 28 February 2016. ↑ Naimark 2010, pp. 133–135. ↑ "Служба безпеки України". Ssu.kmu.gov.ua. Retrieved 2012-09-07. ↑ "SBU documents show that Moscow singled out Ukraine in famine". 5 Kanal. 22 November 2006. Archived from the original on 2007-09-27. Retrieved 22 July 2012. 1 2 Kulchytsky & Yefimenko 2003, pp. 63–72. ↑ Marples 2007, p. 64. ↑ Rosefielde 2009, p. 259. ↑ Snyder 2010, p. vii. ↑ Snyder 2010, p. 413. ↑ Lemkin, Raphael (1953). "Soviet Genocide in the Ukraine" (PDF). Retrieved 22 July 2012. Raphael Lemkin Papers, The New York Public Library, Manuscripts and Archives Division, Astor, Lenox and Tilden Foundation, Raphael Lemkin ZL-273. Reel 3. Published in L.Y. Luciuk (ed), Holodomor: Reflections on the Great Famine of 1932–1933 in Soviet Ukraine (Kingston: The Kashtan Press, 2008). ↑ Chamberlin, William Henry (20 March 1983). "Famine proves potent weapon in Soviet policy" (PDF). The Ukrainian Weekly. 51 (12): 6. Retrieved 22 July 2012. ↑ William Henry Chamberlin. "The Ukraine: A Submerged Nation, published in 1944". Openlibrary.org. Retrieved 2012-09-07. ↑ "What Is the Ukraine Famine Disaster of 1932–1933?". semp.us. 2 January 2005. Archived from the original on 2007-11-09. 1 2 Radzinsky 1996, pp. 256–9. ↑ Conquest 2001, p. 96. ↑ Pipes 1995, pp. 232–6. ↑ Editorial (14 July 2002). "Famine denial" (PDF). The Ukrainian Weekly. 70 (28): 6. Retrieved 22 July 2012. ↑ Mace 2004, p. 93. ↑ Century of Genocide: Critical Essays and Eyewitness Accounts. p. 93. ISBN 0-415-94429-5. ↑ Levy, Clifford (15 March 2009). "A New View of a Famine That Killed Millions". New York Times. ↑ Dmytro Horbachov (1998). "Fullest Expression of Pure Feeling". Welcome to Ukraine (1). Retrieved 25 January 2016. ↑ Wilson 2002, p. 144. 1 2 "30 U.N. member-states sign joint declaration on Great Famine" (PDF). The Ukrainian Weekly. 71 (46): 1, 20. 16 November 2003. Retrieved 22 July 2012. ↑ Subtelny 2002, p. 418. ↑ Interfax-Ukraine (27 April 2010). "Yanukovych: Famine of 1930s was not genocide against Ukrainians". KyivPost.com. Archived from the original on 2014-07-24. Retrieved 21 July 2012. 1 2 Motyl, Alexander J. (29 November 2012). "Yanukovych and Stalin's Genocide". World Affairs. Retrieved 2 December 2012. 1 2 Interfax-Ukraine (27 April 2010). "Our Ukraine Party: Yanukovych violated law on Holodomor of 1932–1933". KyivPost.com. Archived from the original on 2014-03-03. Retrieved 22 July 2012. ↑ "Commemoration of the Holodomor, the artificial famine in Ukraine (1932–1933)". European Parliament. 23 October 2008. Retrieved 22 July 2012. ↑ "European Parliament resolution of 23 October 2008 on the commemoration of the Holodomor, the Ukraine artificial famine (1932–1933)". European Parliament. 23 October 2008. Retrieved 21 July 2012. 1 2 "Yanukovych reverses Ukraine's position on Holodomor famine". RIA Novosti. 27 April 2010. Retrieved 22 July 2012. ↑ "PACE finds Stalin regime guilty of Holodomor, does not recognize it as genocide". RIA Novosti. 28 April 2010. Retrieved 21 July 2012. ↑ Mordini & Green 2009, p. x. ↑ Pourchot 2008, p. 98. ↑ Interfax-Ukraine (12 January 2010). "Holodomor court hearings begin in Ukraine". KyivPost.com. Archived from the original on 2014-03-03. Retrieved 21 July 2012. ↑ "Yushchenko brings Stalin to court over genocide". RT.com. 14 January 2010. Retrieved 25 January 2016. ↑ Interfax-Ukraine (21 January 2010). "Sentence to Stalin, his comrades for organizing Holodomor takes effect in Ukraine". KyivPost.com. Archived from the original on 2014-03-03. Retrieved 21 July 2012. ↑ Marcel Van Herpen (2013). Putinism: The Slow Rise of a Radical Right Regime in Russia. Palgrave Macmillan UK. p. 40. ISBN 978-1-137-28282-8. Retrieved 29 February 2016. ↑ "Schoolchildren to study in detail about Holodomor and OUN-UPA". ZIK–Western Information Agency. 12 June 2009. Archived from the original on 2012-04-22. Retrieved 22 July 2012. ↑ National Museum: Memorial in Commemoration of Famines' Victims in Ukraine, History of the Museum Kiev, 2012. Retrieved on 2 August 2013. 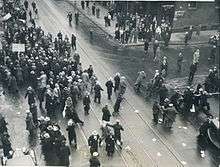 ↑ "Ukrainian-Canadians mark famine's 75th anniversary". CTV.ca. 22 November 2008. Retrieved 22 July 2012. ↑ "Saskatchewan recognises genocide during Holodomor Remembrance Week | News and Media | Government of Saskatchewan". Saskatchewan.ca. 14 November 2013. Retrieved 6 May 2015. ↑ "Saskatchewan first province to recognize Holodomor as genocide" (PDF). XXII (2). Visnyk. 2008. Retrieved 6 May 2015. ↑ "Holodomor". Ucc.sk.ca. 2008. Retrieved 6 May 2015. ↑ "Ontario MPP gets Ukrainian knighthood for bill honouring victims of famine". The Canadian Press. 20 November 2010. Retrieved 22 July 2012. ↑ "Quebec Passes Bill Recognizing Holodomor as a Genocide". Ukrainian Canadian Congress. 3 June 2010. Retrieved 22 July 2012. ↑ "Holodomor Monument – Пам'ятник Голодомору 1932–33". St. Mary's Ukrainian Catholic Church. Retrieved 22 July 2012. ↑ "Unveiling of the Holodomor monument "Bitter Memories of Childhood"". UkrainianWinnipeg.ca. 22 September 2014. Retrieved 22 November 2016. ↑ Berg, Tabitha (6 June 2008). "International Holodomor Remembrance Torch in Baltimore Commemorates Ukrainian Genocide". eNewsChannels. Archived from the original on 2010-01-05. Retrieved 22 July 2012. ↑ Bihun, Yaro (7 December 2008). "Site of Ukrainian Genocide Memorial in D.C. is dedicated" (PDF). The Ukrainian Weekly. 76 (49): 1, 8. Retrieved 22 July 2012. ↑ "Remembrance of Holodomor in Ukraine will help prevent such tragedy in future, says Obama". Interfax-Ukraine. 14 November 2009. Retrieved 22 July 2012. ↑ "Statement by the NSC Spokesman Mike Hammer on Ukraine's Holodomor Remembrance Day". WhiteHouse.gov. 20 November 2010. Retrieved 22 July 2012. ↑ "Statement by the Press Secretary on Ukrainian Holodomor Remembrance Day". WhiteHouse.gov. 19 November 2011. Retrieved 22 July 2012. ↑ "Holodomor Memorial presented in Washington". UNIAN. 5 August 2015. Retrieved 7 November 2015. ↑ Andrea K. McDaniels (7 November 2015). "Organizers, including Timonium man, hope to educate with Ukrainian memorial in D.C.". The Baltimore Sun. Retrieved 7 November 2015. ↑ "Odsłonięto pomnik ofiar Wielkiego Głodu na Ukrainie" [Monument unveiled to victims of the Great Famine in Ukraine]. wPolityce.pl (in Polish). 22 January 2015. Archived from the original on 22 November 2016. Retrieved 22 November 2016. Baumeister, Roy (1999). Evil: Inside Human Violence and Cruelty. New York, NY: Henry Holt and Company. ISBN 978-0-805-07165-8. Conquest, Robert (2002) . 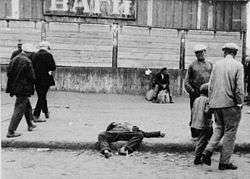 The Harvest Of Sorrow: Soviet Collectivisation and the Terror-Famine. London: Pimlico. ISBN 978-0-712-69750-7. Davies, Robert W.; Wheatcroft, Stephen G. (2006). "Stalin and the Soviet Famine of 1932–33: A Reply to Ellman". Europe-Asia Studies. 58 (4): 625–633. doi:10.1080/09668130600652217. JSTOR 20451229. Dolot, Miron (1985). Execution by Hunger: The Hidden Holocaust. New York, NY: W. W. Norton & Company. ISBN 0-393-30416-7. (Ukrainian) Kulchytsky, Stanislav; Yefimenko, Hennadiy (2003). Демографічні наслідки голодомору 1933 р. в Україні. Всесоюзний перепис 1937 р. в Україні: документи та матеріали [Demographic consequences of the 1933 Holodomor in Ukraine. The all-Union census of 1937 in Ukraine: Documents and Materials]. Kiev: Institute of History. ISBN 966-02-3014-1. Mace, James E. (2008). Ваші мертві вибрали мене... [Your dead chose me...]. Kiev: Vyd-vo ZAT "Ukraïns'ka pres-hrupa". ISBN 978-9-668-15213-9. (A collection of Mace's articles and columns published in Den from 1993 to 2004). Marples, David R. (2007). Heroes and Villains: Creating National History in Contemporary Ukraine. Budapest: Central European University Press. ISBN 978-9-637-32698-1. Meslé, France; Pison, Gilles; Vallin, Jacques (2005). "France-Ukraine: Demographic Twins Separated by History". Population and societies (413): 1–4. Archived from the original (PDF) on 2011-05-19. Mordini, Emilio; Green, Manfred (2009). Identity, Security and Democracy: The Wider Social and Ethical Implications of Automated Systems for Human Identification (PDF). Amsterdam, Netherlands: IOS Press. ISBN 978-1-586-03940-0. Pipes, Richard (1995). Russia Under the Bolshevik Regime. New York, NY: Vintage Books. ISBN 978-0679761846. Potocki, Robert (2003). 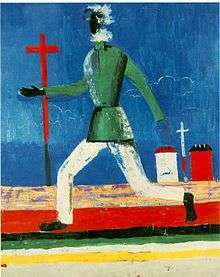 Polityka państwa polskiego wobec zagadnienia ukraińskiego w latach 1930–1939 (in Polish and English). Lublin: Instytut Europy Środkowo-Wschodniej. ISBN 978-8-391-76154-0. Subtelny, Orest (2009) . Ukraine: A History (4th revised ed.). Toronto: University of Toronto Press. ISBN 978-1-442-60991-4. Tauger, Mark B. (1991). "The 1932 Harvest and the Famine of 1933" (PDF). Slavic Review. 50 (1): 70–89. doi:10.2307/2500600. Tauger, Mark B. (2001). "Natural Disasters and Human Actions in the Soviet Famine of 1931–1933". The Carl Beck Papers in Russian & East European Studies. University of Pittsburgh (1506). Tottle, Douglas (1987). Fraud, Famine, and Fascism: the Ukrainian Genocide Myth from Hitler to Harvard. Toronto: Progress Books. ISBN 0-919396-51-8. Vallin, Jacques; Meslé, France; Adamets, Serguei; Pyrozhkov, Serhii (2002). "A New Estimate of Ukrainian Population Losses during the Crises of the 1930s and 1940s" (PDF). Population Studies. 56 (3): 249–264. doi:10.1080/00324720215934. Weiss-Wendt, Anton (2005). "Hostage of Politics: Raphael Lemkin on 'Soviet Genocide'" (PDF). Journal of Genocide Research. 7 (4): 551–559. doi:10.1080/14623520500350017. Archived from the original (PDF) on 2007-06-10. Werth, Nicolas (2010). "Mass deportations, Ethnic Cleansing, and Genocidal Politics in the Latter Russian Empire and the USSR". In Donald Bloxham; A. Dirk Moses. The Oxford Handbook of Genocide Studies. Oxford: Oxford University Press. ISBN 978-0-199-23211-6. Wheatcroft, Stephen G. (2001a). "Current knowledge of the level and nature of mortality in the Ukrainian famine of 1931–3" (PDF). In V. Vasil'ev; Y. Shapovala. Komandiri velikogo golodu: Poizdki V.Molotova I L.Kaganovicha v Ukrainu ta na Pivnichnii Kavkaz, 1932–1933 rr. Kyiv: Geneza. Уиткрофт, С. [Wheatcroft, S.] (2001b). "О демографических свидетельствах трагедии советской деревни в 1931–1933 гг." [On demographic evidence of the tragedy of the Soviet village in 1931–1933]. In V.P. Danilov; et al. Трагедия советской деревни: Коллективизация и раскулачивание 1927–1939 гг. : Документы и материалы [The Tragedy of the Soviet Village: Collectivization and Dekulakization 1927–39: Documents and Materials] (in Russian). 3. Moscow: ROSSPEN. ISBN 5-8243-0225-1. Dolot, Miron, Who killed them and why? : in remembrance of those killed in the Famine of 1932–1933 in Ukraine, (Cambridge, Mass: Harvard University, Ukrainian Studies Fund, 1984);"Execution By Hunger,The Hidden Holocaust" (W.W. Norton & Company,1985). Famine in the Soviet Ukraine 1932–1933: a memorial exhibition, Widener Library, Harvard University, prepared by Oksana Procyk, Leonid Heretz, James E. Mace (Cambridge, Mass: Harvard College Library, distributed by Harvard University Press, 1986). Wheatcroft, S. G. (2000). "The Scale and Nature of Stalinist Repression and its Demographic Significance: On Comments by Keep and Conquest" (PDF). Europe-Asia Studies. 52 (6): 1143–1159. doi:10.1080/09668130050143860. ISSN 0966-8136. Rajca, Czesław (2005). Głód na Ukrainie. Lublin/Toronto: Werset. ISBN 83-60133-04-2. "Holodomor survivors share their stories". Retrieved 5 Nov 2013. "Harvard Ukrainian Research Institute's MAPA Digital Atlas of Ukraine focus on the history of the Holodomor". Retrieved 5 Nov 2013. (Russian)/(Ukrainian) Valeriy Soldatenko, "A starved 1933: subjective thoughts on objective processes", Zerkalo Nedeli, 28 June – 4 July 2003. Available online in Russian and in Ukrainian. Caryle Murphy (1 October 1983). "Ukrainian Americans Commemorate Famine in Homeland 50 Years Ago". The Washington Post. Archived from the original on 2012-03-15. ↑ "The Institute of National Remembrance | Holodomor. The Great Famine in Ukraine 1932–1933". Ipn.gov.pl. 2009. Retrieved 6 July 2015.